Power BI has features that enable people with disabilities to more easily consume and interact with Power BI reports. These features include the ability to consume a report using the keyboard or a screen reader, tabbing to focus on various objects on a page, and thoughtful use of markers in visualizations. Beginning with the September 2017 release of Power BI Desktop, you can press the ? 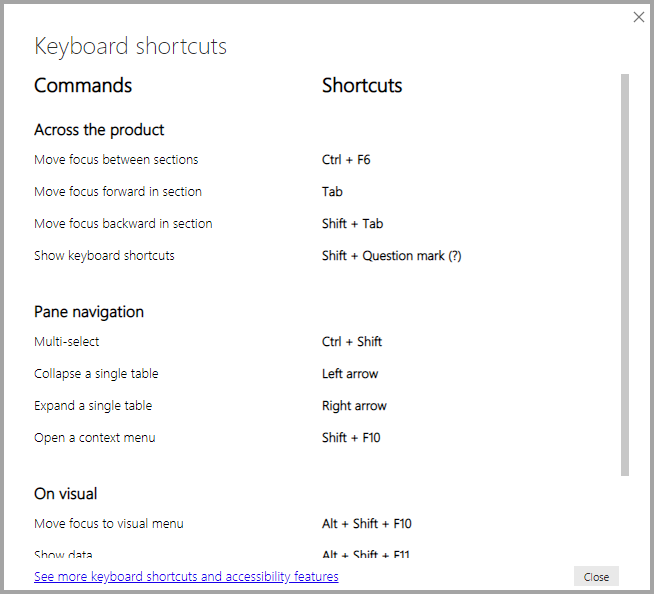 key to show a window that describes the accessibility keyboard shortcuts available in Power BI Desktop. When viewing a report, generally you should have scan mode off. You can switch focus between the report page tabs, or objects on a given report page, using Ctrl+F6. When focus is on report page tabs, use the Tab or Arrow keys to move focus from one report page to the next. The title of the report page, and whether it's currently selected, is read out by the screen reader. To load the report page currently under focus, use the Enter or Space key. When focus is on a loaded report page, use the Tab key to shift focus to each object on the page, which includes all textboxes, images, shapes, and charts. The screen reader reads the type of object, the object's title (if it has one), and a description of that object if it's provided by the report author. As you navigate between visuals you can press Alt+Shift+F10 to move focus to the visual header, which contains various options including sorting, exporting the data behind the chart, and Focus mode. You can press Alt+Shift+F11 to present an accessible version of the Show data window. This lets you explore the data used in the visual in an HTML table, using the same keyboard shortcuts you normally use with your screen reader. The Show data feature is only accessible to a screen reader through this keyboard shortcut. If you open Show data through the option in the visual header, it will not be accessible to a screen reader. When using Show data, turn on scan mode to take advantage of all the hot keys your screen reader provides. Beginning with the July 2018 release of Power BI Desktop, slicers also have accessibility functionality built in. When you select a slicer, to adjust the value of a slicer use CTRL+right arrow (control plus the right arrow key) to move through the various controls within the slicer. For example, when you initially press CTRL+right arrow the focus is on the eraser, and pressing the SPACE bar is equivalent to clicking the eraser button, which erases all values on the slicer. You can move through the controls in a slicer by pressing the TAB key. Pressing the TAB key when on the eraser moves to the drop-down button. Another TAB then moves to the first slicer value (if there are multiple values for the slicer, such as a range). 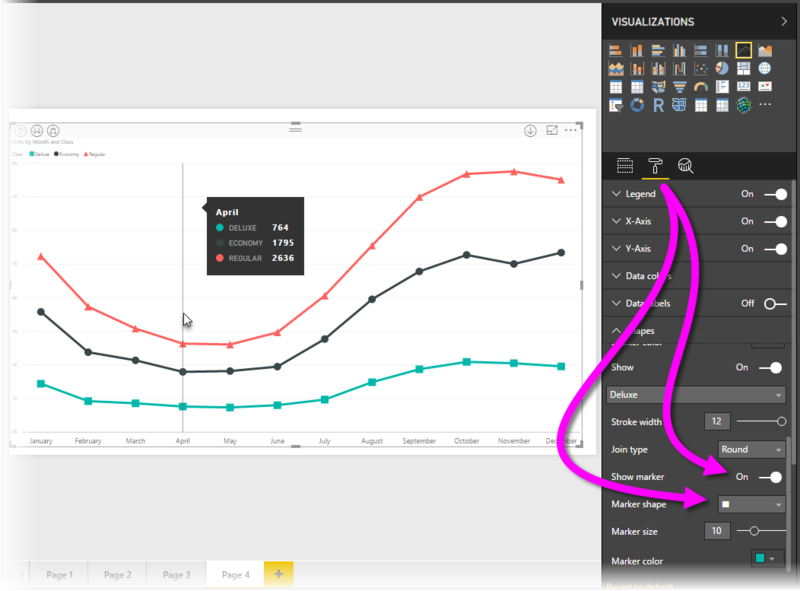 These accessibility additions were created to let users fully consume Power BI reports using a screen reader and keyboard navigation. 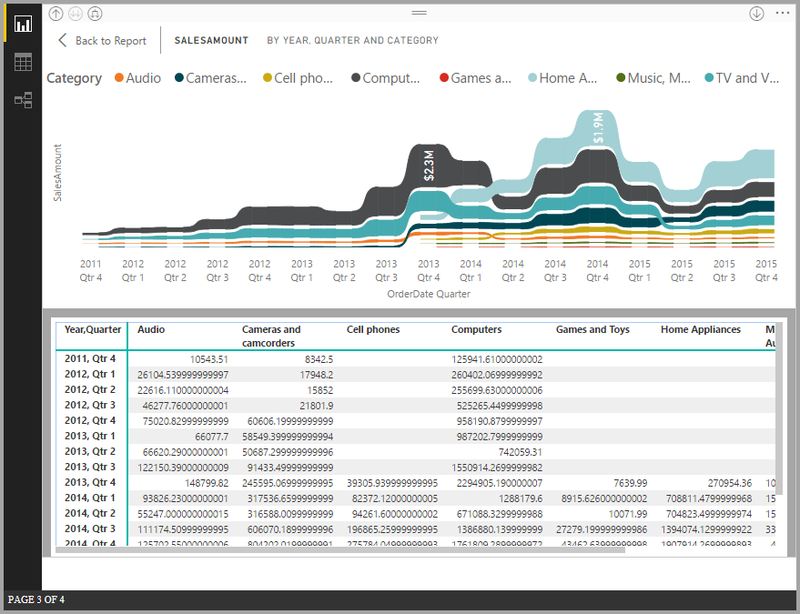 The following tips can help you create Power BI Desktop reports that are more accessible. For Line, Area, and Combo visuals, as well as for Scatter and Bubble visuals, turn markers on, and use a different Marker shape for each line. To turn Markers on, select the Format section in the Visualizations pane, expand the Shapes section, then scroll down to find the Markers toggle and turn it to On. Then, select the name of each line (or area, if using an Area chart) from the drop-down box in that Shapes section. Below the drop-down, you can then adjust many aspects of the marker used for the selected line, including its shape, color, and size. Using a different Marker shape for each line makes it easier for report consumers to differentiate lines (or areas) from each other. As a follow on to the previous bullet, don't rely on color to convey information. In addition to using shapes on line and scatter charts, don't rely on conditional formatting to provide insights in tables and matrices. Pick an intentional sort order for each visual on your report. When screen reader users navigate the data behind the chart, it picks up the same sort order as the visual. Select a theme that is high contrast and color blind friendly from the theme gallery, and import it using the Theming preview feature. For every object on a report, provide Alt Text. Doing so ensures that consumers of your report understand what you are trying to communicate with a visual, even if they cannot see the visual, image, shape, or textbox. 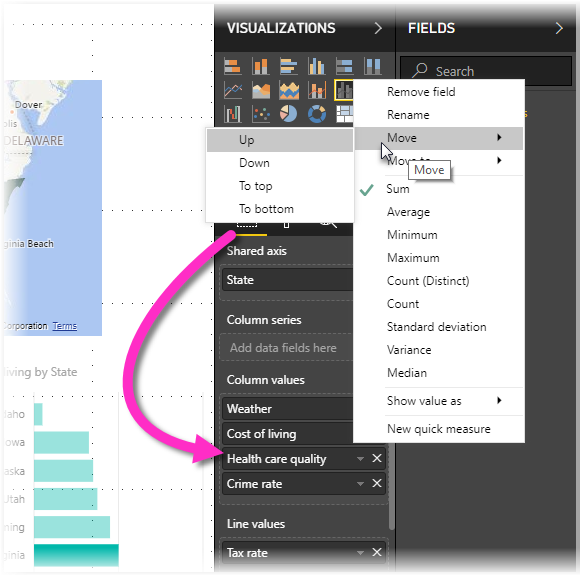 You can provide Alt Text for any object on a Power BI Desktop report by selecting the object (such as a visual, shape, and so on) and in the Visualizations pane, select the Format section, expand General, scroll to the bottom, and fill in the Alt Text textbox. Make sure your reports have sufficient contrast between text and any background colors. There are several tools such as Color Contrast Analyser you can use to check your report colors. Use text sizes and fonts that are easily readable. Small text size, or fonts that might be difficult to read, are unhelpful for accessibility. Include a title, axis labels, and data labels in all visuals. Use meaningful titles for all report pages. Avoid decorative shapes and images in your report if possible, as they are included in the tab order of the report. If you need to include decorative objects in your report, update the object's alt text to let screen reader users know that it is for decoration. 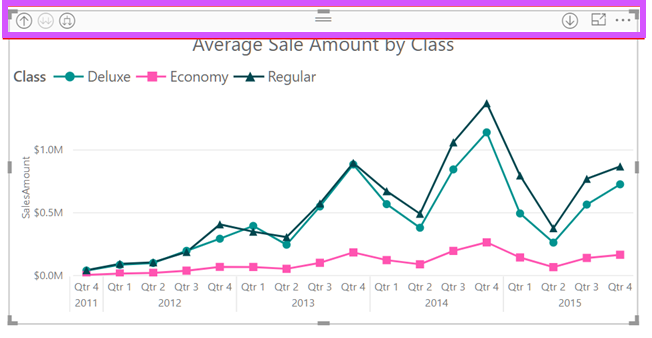 Beginning with the October 2018 release of Power BI Desktop, the Fields well can be navigated with a keyboard and interacts with screen readers. To improve the process of creating reports with screen readers, a context menu is available to allow moving fields in the well up or down in the Fields list, or moving the field to other wells, such as Legend or Value or others. When you use high contrast modes in Windows, those settings and the palette you select are also applied to reports in Power BI Desktop. 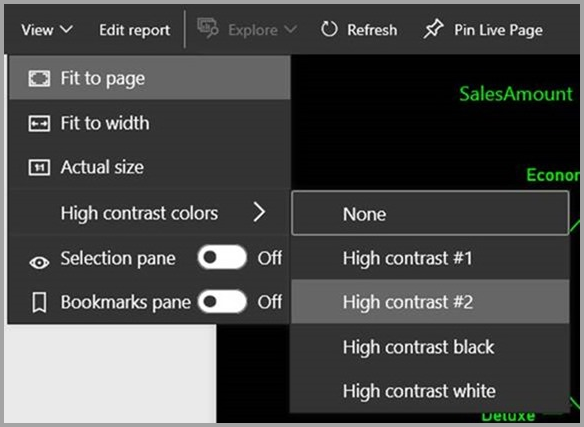 Power BI Desktop automatically detects which high contrast theme is being used in Windows, and applies those settings to your reports. 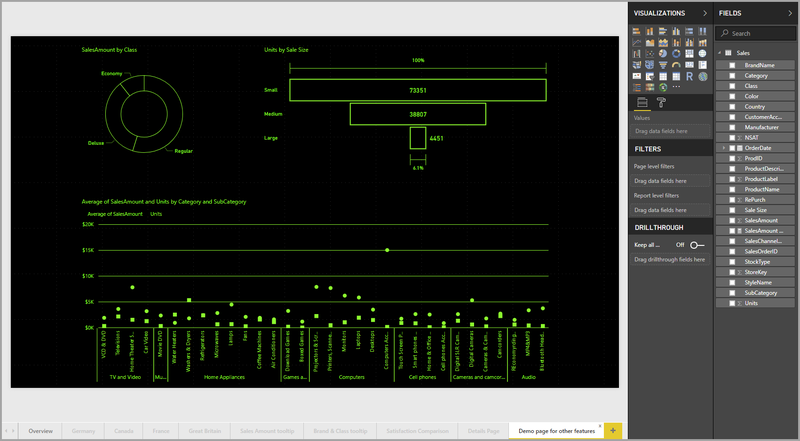 Those high contrast colors follow the report when published to the Power BI service, or elsewhere. The Power BI service also attempts to detect the high contrast settings selected for Windows, but how effective and accurate that detection is depends on the browser being used for the Power BI service. 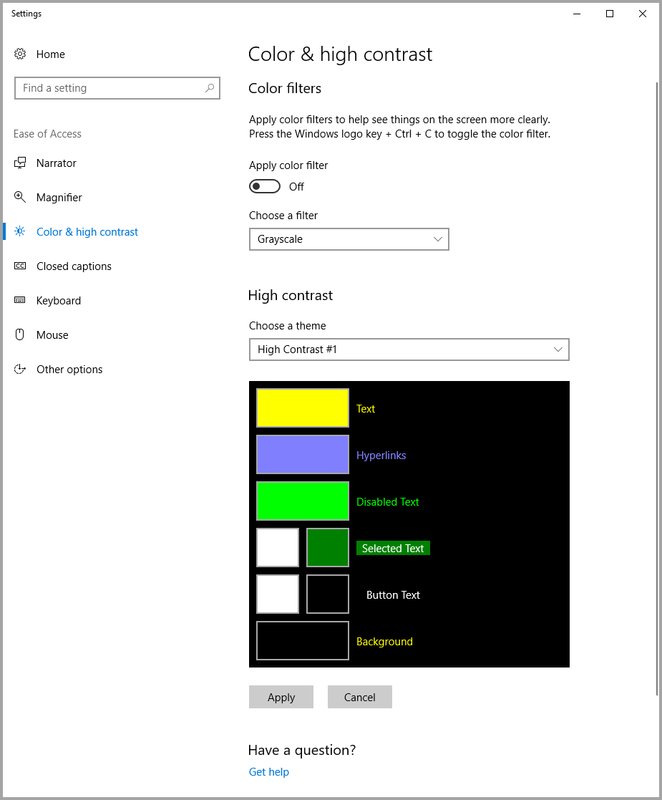 If you want to set the theme manually in the Power BI service, you can select View > High contrast colors and then select the theme you would like to apply to the report. 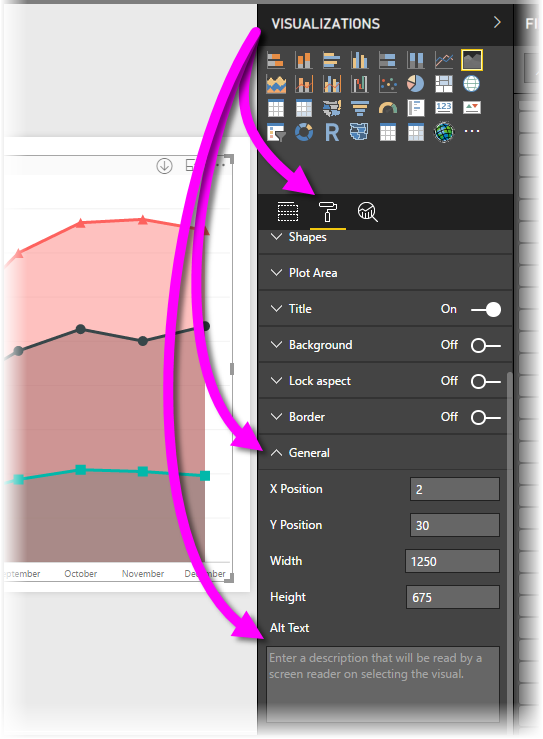 When in Power BI Desktop, notice that some areas such as the Visualizations and Fields fields do not reflect the selection of high contrast Windows color schemes. When using screen readers with Power BI Desktop, you'll have the best experience if you open your screen reader of choice prior to opening any files in Power BI Desktop. If you are using Narrator, there are some limitations around navigating Show data as an HTML table. In our continued effort to improve accessibility, the previous list of experiences also support screen readers and high contrast settings.